Bear Creek Lumber sells many fencing products in many species of lumber. All fencing options are available in a variety of grades ranging from vertical grain clear to utility. 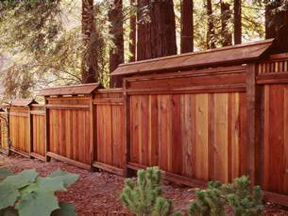 Western Red Cedar, Alaskan Yellow Cedar, Port Orford Cedar and California Redwood are the most commonly used species of wood for fencing. Douglas Fir poles (peeled and rough) are also used for rail fencing. BCL can offer any size fencing you may need. 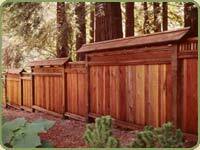 Above: our yard has an unpeeeled douglas fir outer fence and a red cedar tall inner fence. 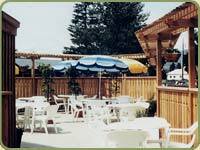 Next down, the Virginian resort built this pool fence with western red cedar. 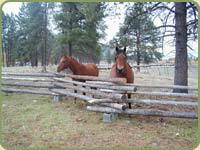 These two horses enjoy a peeled posts douglas fir fence. Next, detail of our lumber yard fence.